What do you do when you have a day off? 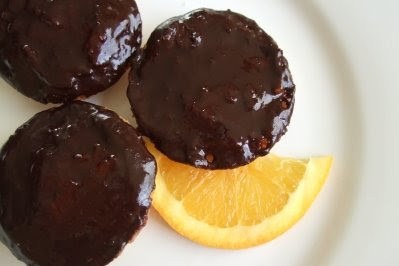 I had one off recently and was feeling a bit miserable so I decided to cheer myself up by making some homemade jaffa cakes. I grew up eating a lot of these, living in the Middle East surrounded by a lot of British expat kids. 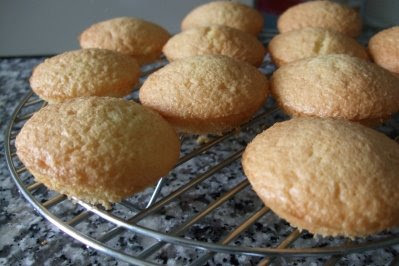 There was always the inevitable debate about whether they were cakes or biscuits. 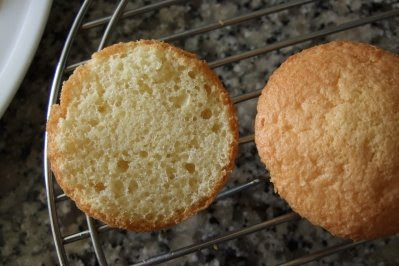 Tomred has since explained to me that the definitive indicator is that a cake will go hard when stale whereas a biscuit will go soft when it gets stale. 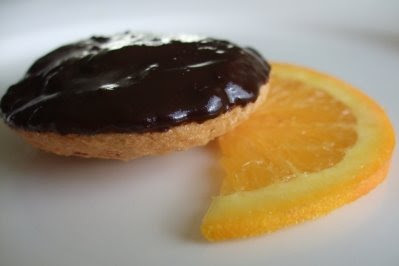 There's a really great balance to a jaffa cake. The super thin, soft and airy sponge covered with an orange jelly layer and a crunchy thin top of dark chocolate. Once I realised I could get them at Aldi, I introduced them to my brother, who has become obsessed with them and eats them by the boxful. (I don't know how he does it, I feel ill after too many) So since I was spending the day at his house I thought I'd be a nice sister and attempt to make some for him. 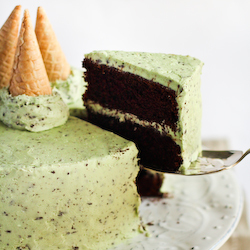 Because I still firmly believe fresh baked goods made from scratch are always better! These turned out pretty good. 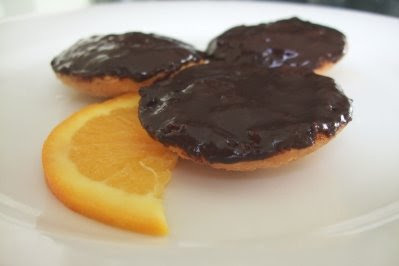 I would have liked a slightly moister sponge, and a thinner layer of chocolate, but after putting them in the fridge overnight the sponge moistened because of the marmalade and the chocolate hardened nicely. They were lovely with a cup of tea! 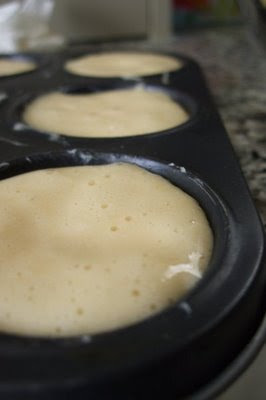 Spoon the mixture into 18 well-greased, round-bottomed patty tins. Bake for about 10 minutes at 200°C until golden brown. Cool on a wire rack. 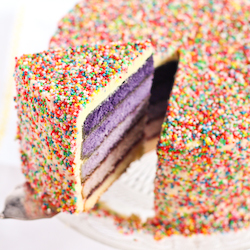 At this point I decided to slice my cakes in half, to make them look closer to the thin cakes that you buy in the supermarket. 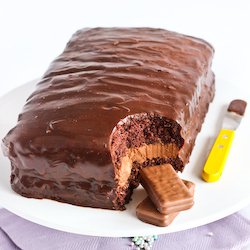 However, feel free to leave them uncut to have a higher sponge to chocolate ratio. 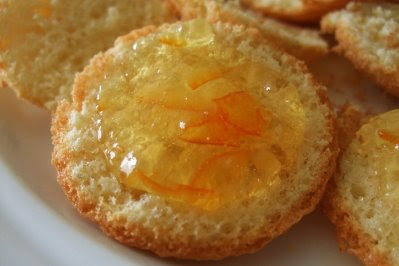 Spread a dollop of marmalade over each cake. 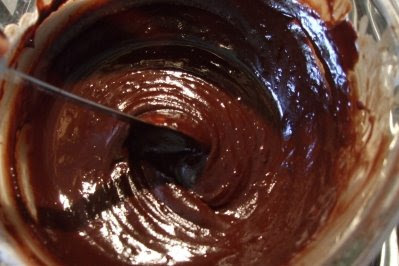 Put the chocolate, orange rind, oil and water into a bowl over a pan of hot water. Stir well until melted. 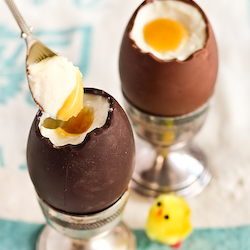 Cool until the chocolate starts to thicken and then spoon over the marmalade. Leave to set. Hee hee awesome Jaffa face.. cute and tasty! Jaffa cakes are the best! And it's so awesome you can get them at Aldi, the mini sized jaffa cakes are great. You can get them at some Woolies too, but they're like $3.50 for half of Aldi's size. these look great. The recipe I tried to make mine was sooo different, and very fiddly. I loved it but can't imagine doing it again haha. I only like the lindt orange intense but ohmylordy the marmalade looks so good! I've never even heard of a jaffa cake! these look great :) I like the jaffa man. hehe. FFichiban - Thanks! Haha I'm not surprised that you disagree, Mr. 600g Counter Burger! Mr. Taste - I know! I was so excited when I first realised you can get them there. I've seen them in Coles as well but never tried them. Lorraine - Aww if you're not huge on orange and chocolate then you should try the berry flavoured ones at Aldi! Trisha - Mmm I love marmalade! Betty - You shold try them! You can buy them in quite a few places now :) Hehe thanks! 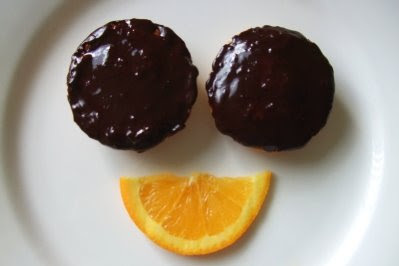 I like the happy jaffa man :) I've been meaning to make these too, because the bf loves them (but they're too expensive to buy, and the cheaper Aldi version just isn't quite the same). :D thanks, ooh I would love to see your version! It's been so long since I had the original ones that I don't mind settling for the aldi ones.